"Oh, boy, are we gonna have fun today!" After Chevy Chase, the next break-out star of NBC's Saturday Night Live turned out to be "Mr. Bill," Walter Williams' hapless Play-Doh creation. Mr. Bill starred in some 18 short films aired during SNL creator Lorne Michaels' initial tenure as producer, ending when Jean Doumanian took over the show for the disastrous 1980-1981 season. Illegitimate, pirated T-shirts and buttons abounded, and Williams created book-and-record sets, posters, and other official Mr. Bill merchandise. I loved Mr. Bill as a kid growing up in the 1970s, though I was rarely able to stay up late enough to watch SNL and had to content myself with the prime-time Best Of... reruns and ancillary Mr. Bill paraphernalia. Though the phrase "Oh, nooo, Mr. Bill!" was a bootlegger's invention, never used in the early canon, Anchor Bay's DVD bows to popular convention and adopts the title Ohh Nooo!!! Mr. Bill's Classics!. The disc includes all of the original short films, along with significant new material created for this DVD (see the "Extras" section for details), and I sat down to watch with great anticipation. First of all, let me recommend against watching all of the films in one sitting. The physical humor of the Mr. Bill shorts is not exactly subtle, and it's easier to appreciate the abuse heaped upon our hero in small doses. While the sophistication of the situations and the intricacy of the props improved markedly over the years, the basic joke remained the same: Mr. Bill, enthused about some new adventure, meets with dismemberment, decapitation, ignition, extrusion, dissolution, and just about every other sort of indignity that can be heaped upon his unfortunate Play-Doh body. His girlfriend Miss Sally and his cute little dog Spot are of no help whatsoever against the apparently well-meaning forelimbs of Mr. Hands and the sinister plots of Mr. Bill's villainous arch-enemy, Sluggo. But this is not to say that The Mr. Bill Show depends exclusively on "sick" humor. Mr. Bill, inanimate and naïve as a child, is a tremendously appealing character; even as we laugh at the violence inflicted upon him, we know he'll be back, resiliently happy and ready for another shot at enjoying himself. Even in reduced circumstances, homeless and clutching a bottle of "medicine," Mr. Bill yearns for the better life he is certain he can achieve, though his world seems stacked against him. We sympathize with his growing realization (in the later shorts) that "maybe Mr. Hands isn't such a good friend after all!" and hope against hope that he might triumph over his tormentors. He's a Play-Doh Everyman, whose high-pitched, plaintive cries of "Oh, noooo! Why? Why?" gave voice and laughter to a generation of politically disenfranchised, inflation-squeezed young Americans. Walter Williams' Mr. Bill is a uniquely American creation, slipping his audience a much-needed dose of optimism in a deceptively cynical wrapper. Marvelous, hilarious stuff. Image Transfer Review: Anchor Bay's DVD presents the Mr. Bill shorts in their original 1.33:1 full-frame aspect ratios, transferred with loving care from the original Super 8mm and 16mm films. Some of the sources are scratched and damaged, gate wobble turns up on occasion, and the Super 8mm shorts have significant grain in many shots, but the digital transfer looks just great, with bright primary colors and solid detail (especially in the more elaborate 16mm productions). Compared to the early Magnetic Video Mr. Bill VHS release, Anchor Bay's DVD is a revelation, and the new material looks just fine. 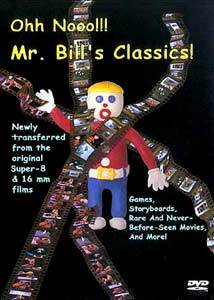 Audio Transfer Review: The DVD preserves the original monophonic audio of the Mr. Bill shorts, presented in Dolby Digital 2.0 for ProLogic-decoding to the center speaker. These were low-budget productions, and Mr. Bill's high-pitched voice is sometimes less than intelligible, but the spirit comes through loud and clear. Oddly, the brand-new Mr. Bill piece included in the supplements has rather poor audio by comparison, with a lot of background noise and audio "blanking" between lines. But the original films have been cleanly transferred into the digital domain. One of the funniest features on this disc, as Mr. Bill and Mr. Hands (both voiced by Williams) provide running commentary on each of the shorts. It's oddly engaging to hear Mr. Bill reminiscing in character about his career and the circumstances surrounding each film, while Mr. Hands provides some information about location shooting and Williams' association with Saturday Night Live. Charming, funny, and entertaining. 5 "grades" of trivia questions based on the classic Mr. Bill films, with graduation rewards drawn from two very funny live-action films directed by Walter Williams. I don't usually enjoy these multiple-choice features, and the clips shown after each correct answer become irritating after a while, but the reward segments are well worth the struggle. I only wish they were available directly, to facilitate repeat viewing. A "game show" format similar to the Pop Quiz, but the reward (for identifying the circumstances precipitating each of Mr. Bill's woeful cries) is a brand-new Mr. Bill short. This is a real treat, as Walter Williams converses with his creation, brought to life for the first time using CG animation, with inevitably disastrous results for the newly-footloose Mr. Bill. An entertaining look at Mr. Bill's family album and high school yearbook. The "family album" artwork is adapted from the "Mr. Bill Show" book-and-record set originally published in the 1970s, though some of the jokes have been improved, and the yearbook segment appears to be of similar origin. Unfortunately, Williams' great "Mr. Bill in Space" book-and-record set is not represented here. These are not true storyboards at all, but a rather uneventful "extra," providing a newly-drawn "sketch" of a shot from each Mr. Bill short which then segues into a brief clip. Fans of Mr. Bill's yellow dog will enjoy these selections, presenting Spot's appearance and demise from each of the shorts, one at a time, cycling as this option is selected. A funny idea (though it wears out its welcome rapidly), this selection uses alternate angles to "cover up" Mr. Bill's violent moments with harmless images of kids, animals, carnival rides and other pleasantries, though the original audio plays right on through in all its abusive glory. Anchor Bay's Ohh Nooo!!! Mr. Bill's Classics! DVD resurrects the resilient Play-Doh character in fine DVD style, with a bevy of affectionate, often hilarious supplements by Mr. Bill's creator, Walter Williams. The digitally-remastered original films have never looked this good, and while the humor works best in small doses, this compilation is a must-own for Mr. Bill's legion of fans. Recommended with a hearty "Hoo hoo, kiddies!"